Heath Decker 150 games & Tim Jones 100 games milestones. Photo courtesy of Sharon Jones Photography. We played the traditional rivals East Ringwood at home. 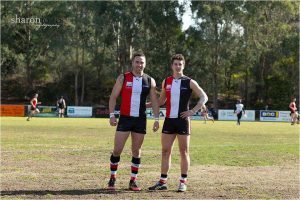 We had Heath Decker, having almost his best year ever, at 35 years of age playing his 150th game and Tim Jones playing his 100th. Well done to both of those boys. After a close loss last week we wanted to start well and put East on the back foot. We lost Jones to a dislocated elbow 5 mins in and Locco late in the first quarter which made things tough. However, with a couple of sharp handballs from Griffiths which led to our first 2 goals to Wood and Dunne we had a small break at quarter time. .
Our midfield, led by van Unen who was clean in close on a difficult day with the conditions, were on top early. The second quarter was bit of an arm wrestle. Hoegel looked dangerous forward and our back 6 were limiting East’s scoring but we had not fully taken advantage of the play we had. We led by a 21 points at half time. The boys were urged to put the foot down in the third. Joyner had a huge quarter. van Unen and Whelan also continued their good work around the ball and Hoegel kicked two for the quarter. Our two ruckmen Cullinan and Mackinnon also got the better of a key duel in the middle. In the end we finished the game off well for a pretty solid win. A great reward for the group who have been through a trying couple of months. We had an even contribution Saturday and lots of players could be classed as good or better on the day. It would be great to finish off the season with a good win against Norwood this week. Brett Moyle – Senior Coach. but the boys were up and about and ready to create a W.
opposition a sniff and kept them in the contest. the conditions, quick, direct but changing direction when we could and it was on. We kept East Ringwood scoreless in the 2nd , whilst kicking 2.2 ourselves. management of ground and not giving East an opportunity to influence the score. Ringwood a couple opportunities which probably make the scoreboard reflect a closer result. other local rival in Norwood.